Amidst the shallow celebrity and materialism of our times rises a series of books that aims to stretch the imaginations, the souls and the characters of our young people. Meet Emrys as he washes up on the beach, not knowing who he is, not knowing his past, and, more powerfully, not knowing his purpose. Emrys will someday become Merlin, the most powerful wizard ever to live, but, for now, he is a struggling young lad, without a sense of self, who will soon lose his eyesight and have to navigate the isle of Fincayra using second sight. Brilliant imagination guides us as we travel along with Emrys as he meets challenge after challenge, not only in the people he encounters, but more importantly, within himself. What a gift for all those young readers who hunger for goodness and a companion, as they make choices along their journey into adulthood. 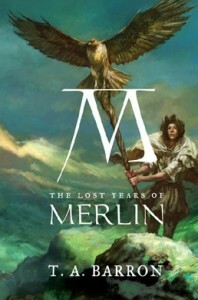 The other outstanding books in this series are Book 2: Seven Songs of Merlin; Book 3: Mirror of Merlin; Book 4: Fires of Merlin; and Book 5: Wings of Merlin. Which character are you? Take the quiz and find out!